The two victims injured in the shooting last night [July 3] at Gombey’s in St. David’s are both in stable condition in the hospital, the police confirmed today. Last night the police confirmed that at approximately 11.45pm “a lone male gained entry into the premises and discharged his firearm” and then escaped on a motorcycle. 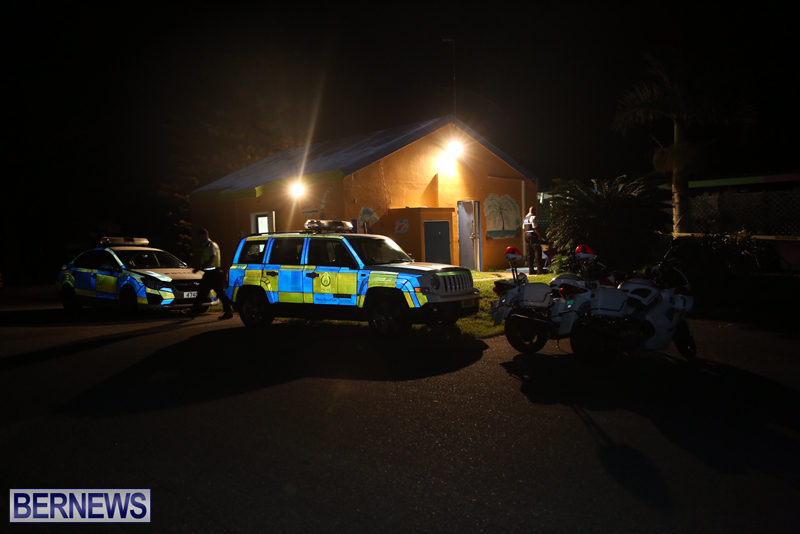 A police spokesperson said, “The two men who were involved in the shooting that took place last night at Gombey’s in St. David’s are both in stable condition in the hospital. What’s wrong with the youts today? Bring back the Americans to show these guys what real firearms looks like. We didn’t have this mayhem when the big boys were in town. Tell you what. Your part of the problem. Read what you wrote and then kneel and say a prayer. DO YOU FEEL SAFE IN YOUR HOME AT NIGHT or even during the day now? Lets Make bringing this gun violence and murder to an end TOP PRIORITY! Bring in special troops, helicopter, drones, Cameras etc. Us Technology used by armies during war time to find the culprits, find the guns, find the drugs, break up the gangs. Bermuda, put up or shut up – meaning we all will have to cooperate and make sacrifices in order to end this. Mothers, you may have to turn your son in in order to save his life. lets stop hiding and covering up. Very soon innocent by standers at an even like cup match will be hurt. ALL BERMUDIANS, DEMAND ACTION NOW TO SAVE OUR PEOPLE, OUR YOUNG MEN, OUR COUNTRY. I got no job so I got no money to go out any where. Stupid Island people!! You may to rephrase your comment! This island is full of wonderful people full of potential!! Ask our visitors. There is a small minority of people that your comment may apply to. Leave and go back to your U.K.
Stupid Brits, left the EU. the UK is an island so I agree with you!!!!! Because as Brexit and the ensuing fallout demonstrated, the UK is full of intellectually superior citizens? Wishing you both a speedy recovery!! Blessings to their families! UK you do know that England is an island? I love your response to the stupid Brit!!!!!! Dummy!! not like they brought we guys here on boats or nuffin in the first place right! Like we let them in, we have right to make them leave… o wait…. I’m thinking the death penalty needs to be implemented here. Because these jail sentences are not enough. And we definitely have to make the airport a priority when these criminals jump on the next plane and leave and don’t come back. It’s crazy. Something needs to be done today, tomorrow and until. Laws are in place NOW, so why make more laws. Change the court system, you are arrested with a firearm, ammunition, in your possession, you are guilty, no court case, no inquiry, no wasting public time and money, mandatory jail time, no parole, 15 years. People wake up, only you can make the changes, police can only do so much without public assistance, stop hiding these law breakers and talk. I hope they had insurance, getting tired of theses stupid fights that cause $1000′s of dollars? Its clear the problem is talked about but no solution to problems coming neither the ones we think we leave behind. until we decide as individuals we have role in change and that is oneself. The speech the opinions of others always find ways to offend and the conversation turns ugly. If you don’t have anything good solution or positive words keep them so they can rot your inside and not the world.